Finding time to allow our body and mind to rest and restore is essential in maintaining our general sense of well being. Especially in current times, as the pace of life quicken, we try to do more things with our time and are also expected to respond to our duties within a shorter time frame. All these demands deplete our energy and use up our mental resources faster than we can "sleep it off". Restorative Yoga is a good way to allow our system to find total relaxation and also to replenish our body with wholesome energy. 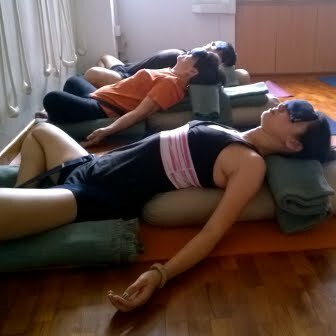 The Restorative Yoga classes are meant to supplement your existing practice thus it is highly recommended that you are already enrolled in a regular class when you join this class. However, we understand that some of you have limited time and would like to come anyway, so ALL are welcome! This class requires minimum 4 sign ups to commence. Please express your interest and we will get in touch with you. Yeoh Su Unn started practicing yoga in 2007. As she immerse in the practice, the asana work on the mat moved beyond the physical realm and evolved into something that nourished and nurtured her entire being. Her practice focuses on developing awareness and observation of existing conditions and from there, adjusting to fulfill the potential.